are, Colon Rollin’® will bring colon hydrotherapy, electro lymphatic therapy, and ionic foot bath services directly to you. Colon Rollin’s® colon hydrotherapy equipment is FDA registered and entirely portable. Attachment to your water source is easy. All House Call/Mobile Service appointments must be made by telephone. 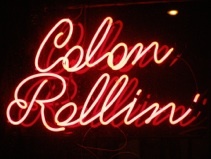 Colon Rollin’® will establish your location and determine the fee. All services must be prepaid in advance. Colon Rollin’® is on the move—literally and figuratively!